The following account is a timely story which occurred in 1990 to a young Greek-American teenager heavily addicted to drugs. The Athenian taxi driver who first heard the story from the young man wrote it down word—for word. He heard the story while driving the young man to a drug rehabilitation center after having an encounter with Saint Ephraim, The Newly Revealed. Saint Ephraim is considered the patron saint of those suffering from drug addiction. The taxi driver then had the story published in the Greek newspaper Orthodox Press. “It was afternoon, one of the usual tumultuous afternoons in downtown Athens. There was a line of people waiting at the Omonia Square Taxi-Stop. “To Koukaki, please!” “With pleasure,” I answered. And that was the extent of our dialogue until the end of the drive, because my passenger’s expressions and mannerisms did not leave much room for conversation. He got out at the summit of Saint John (in Gargareta) on Veikos Street and, a few meters further on, another person hailed my cab. My new passenger was young—around twenty-five or twenty-seven years of age— of medium height, and he was carrying a suitcase. While I was putting his suitcase in the trunk, the young man sat in the front passenger seat. And with a poetic expression that I infrequently used in the past I said: “While departing on your journey to Ithaca, I pray that your trip will be uneventful.” I meant: “Where to?” “Yes,” my fare answered, “to Ithaca, but not to the island, as you said, but to the Ithaca Detoxification Center” which left me speechless for a few seconds. “To the Larisa train station, please,” he added. My young passenger’s reply was truly unexpected, because nothing about his outward appearance; eyes, expression, clothing or behavior betrayed the fact that he was a drug addict. I was overcome with the feelings of pain, sorrow, sympathy and love. I felt an intense feeling in my heart which made it beat irregularly. In fact tears rolled down my cheeks just thinking about the affliction that my brother in Christ was suffering. I tried to control my emotions. I wanted to learn under what circumstances he ended up becoming a drug addict. I wanted to know because I was a father of children approaching adolescence. After introducing ourselves to one another I asked him if he could tell me something about his life and his addiction, if recalling such events would not be upsetting to him. He readily agreed to tell me the whole story. “To begin with, it has been two months since I’ve taken drugs and I now feel like any other normal person. I have no desire whatsoever to put drugs into my bloodstream any more. I owe this miracle not to any effort of my own, but entirely to the wondrous power of God and His Holy Saints. But let me start from the beginning since you wish to hear about it. I was born in Athens, in Koulaki to be precise, where you picked me up, and I lived there until I was eight years old. I am an only child and my parents loved me pathologically and indulged my every whim. When I was eight, we all left for America for a better life. My relatives there helped my parents find work and I attended school. As I grew up, however, my senseless adolescent desires and vices overwhelmed me. Because of my pampered upbringing, I easily got mixed up with bad company and soon got involved in taking marijuana and hashish. After some time these drugs no longer satisfied me or my friends. So we all got involved in taking hard drugs, which were as easy to get as it was with marijuana and hashish. These drugs, however, were more expensive and I did not have a job. At first, I stole money from my parents. But later on when my addiction craved the need for larger doses of drugs, it reached a point where I even beat up my parents to get the money I needed to buy drugs. My parents, in the meantime, found out about my drug addiction. I also understood at that point that my condition was getting critical, but there was no way I could turn back. My parents took me to doctors and psychotherapists in the hope that they could do something for me, but to no avail; there was no light at the end of the tunnel. The doctors told my parents that if I did not stop taking drugs, I would not have long to live. One day when I was home alone in a state of great despair, a strange visitor appeared before me whom I had never seen before. He was of medium height. He had large round eyes that rolled about, and black bushy hair that was over fifteen centimeters in length. He also had horns and a tail. His booming voice and fearsome appearance left me speechless. He proceeded to tell me a detailed account of my life from the time that I was born up until that very moment. I was correct in every detail of my life. He said, ‘you have enjoyed everything, there is nothing more left for you to do but to come with me.’ “How?” I asked. He said, ‘you will take the car and you will go to this particular highway. Once on the highway, you will accelerate the speed of the car until you reach a certain velocity.’ “I don’t remember the exact speed he indicated, ‘and I will be waiting for you there at the end.’ The road that he wanted me to take was a straightaway for many miles and at a certain point the road came there was a curse. If anyone drove too fast on that road going into that curse, he would lose control of the car, crash into a wall and be killed. I had heard about many such accidents happening at that very spot on that highway. Doing exactly as he instructed me, I too, ended up smashing my car into that wall off the highway. The car was totally demolished but I escaped with only minor injuries. After they gave me first aid, I was able to go home. After he said this, he suddenly disappeared and I did not even know how he had entered my house or who he was. But just like the first time, I obediently put the plan into action. I prepared an overdose of drugs in a syringe and tried to inject myself in my arm that was filled with scars. As I said, the dose was a large one and I immediately fell unconscious. While I was laying there unconscious, I suddenly saw a tall man approach me wearing a black cassock wearing a black monastic cap with a Cross engraved on it. He said, ‘Do not be afraid, ‘You will get well, and when you return to Greece, you must come to my house. I am Ephraim;* after hearing these words, I immediately got up as if I had not even taken any drugs at all. I then felt a great desire to leave for Greece. When I told this to my mother, she was very surprised and considered it a miracle because my parents had tried many times before to take me to Greece to get me out of that bad environment. I then told my mother everything that had happened to me, and we left on our journey to Greece. When we arrived in my old neighborhood, we immediately went to see the priest of the parish. After relating my story to him, he explained to me who the strange visitor was who came to my home and what he had wanted from me. He told me he was Satan and he wanted to kill me and destroy my immortal soul. I thank God from the depths of my being for sending me His Saint to save me from damnation. I then fasted for fifteen days, went to confession and received Holy Communion. When I saw an icon of St. Ephraim for the first time, I realized it was he who had visited me in America and miraculously delivered me from my addiction. The Great Martyr and miracle-worker Ephraim was born on September 14th, 1384 in Trikala, Thessaly, Greece. He was orphaned in early childhood when his father died. His pious mother nurtured him along with his six brothers and sisters in the love of Jesus Christ. At the age of fourteen, St. Ephraim was led by the Holy Spirit to go to the Holy Monastery of the Annunciation of the Virgin Mary on Mount Amomon, (The Pure Ones), in the province of Attica in Southern Greece. He lived at this Monastery for twenty-eight years before he was martyred for his faith in Jesus Christ. He carried the Cross of Jesus Christ with great courage when the Muslims overran Greece in the 15th century and captured him. During his short life, he became a fervent follower of Jesus Christ and devoted his life to asceticism. He emulated the great ascetics and saints of the Church for a period of twenty-eight years. He acquired an undying love for Jesus Christ and turned away from all worldly things. He excelled in asceticism in his Monastery on Mount Amomon. With the blessing of God and with great personal sacrifice, he struggled to purify his soul from all human passions. He succeeded at this and was filled with the power of the Holy Spirit. During his years at the Monastery, with great contrition and fear of God, he was tonsured a schema monk and later was ordained to the Holy Priesthood. He became an angel of God and a fervent confessor of his Orthodox Christian Faith. On his birthday, September 14, 1425, on the feast day of the Holy Cross, he was captured by the invading Muslim Turks in his Monastery and kept under house arrest for eight months. During this time, he was terribly tormented by his captives in their attempt to make him convert to Islam. After eight months, when the Muslims realized that he would never convert to Islam, they put him to death. His martyrdom took place on May 5, 1426, at 9 a.m. Before he gave up his holy soul he was terribly brutalized. He was hung upside down from a sycamore tree in his Monastery. His head and feet were then nailed to the tree. While being impaled on this tree, his torturers took a burning stick from a fire that had been lit nearby and pierced his abdomen with it. He was literally disemboweled. He died and was buried in a shallow grave nearby. During the final moments of his earthly life, St. Ephraim prayed to God to receive his soul into His Kingdom. He was forty-two years old when he died. Five hundred years after his martyrdom, our merciful God revealed to the world all the details of his life in Jesus Christ and his fearful martyrdom. 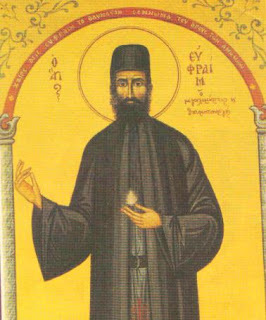 He was revealed to the world in the following miraculous way: St. Ephraim himself appeared to the Abbess Makaria Desipri who was restoring his Monastery in Nea Makri Greece. Through a series of divinely inspired dreams she was directed to the location of his grave where she found his whole skeletal remains. This happened on January 3, 1950. With the miraculous finding of his relics, the reality of his life and martyrdom were confirmed. To this very day, his skeletal remains emit a divine fragrance. From inside the grave in which he was buried for so many centuries, a spring now flows. Many miracles take place in the presence of his relics and through the water of the spring. He has been officially declared a Saint by the Orthodox Church of Greece and today he is a great intercessor to God for the faithful who flock to his home at the Monastery. He is a great contemporary miracle worker because he endured much suffering in defending his Christian faith with his very life. Ever since he was revealed to the world on that fateful day in 1950, he has been working extraordinary miracles for faithful Christians all over the world. We commemorate the Saint’s memory twice during the Church calendar year; January 3rd, the day his holy relics were found, and May 5th, the day of his martyrdom.